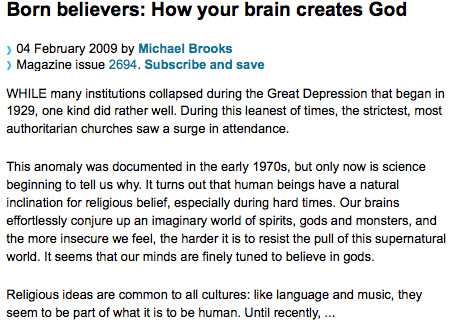 The New Scientist ran an article entitled: ‘Born believers: How your brain creates God’. It proposes that the inclination of human beings to believe in God is natural in that some of the foundations for religious beliefs are” hard-wired” in human brains. (not: ‘hard-wired’ is a misleading bad metaphor for such a flexible and ever-developing organisation). Experiments with children from a few months old to pre-school, have influenced some to conclude that “belief in some form of life apart from that experienced in the body is the default setting of the human brain.” At the same time, it was stated that the ability to conceive of gods is itself not sufficient to give rise to religion. The mind has another essential attribute: “an overdeveloped sense of cause and effect which primes us to see purpose and design everywhere, even where there is none.” This casts a powerful light on the entire root of religions. It is all very well for priests, gurus, theologians and their like to preach their many differing speculative theories to support their need for faith, but science has dispelled most of with solid evidence. The human need for assurances of there being a kind and caring god of some kind or other has a big problem, how to account for the absence of help and support to millions who have prayed to him (or her or it) in the very direct of circumstances with no result. The speculative arguments are very many but none manage an overall consistent answer that does not ignore countless facts and known truths. In short, the human brain (long known not to be infallible in perception or in any other manner), functions to complete incomplete information. There is also the experimental psychological effect known as the ‘psi-phenomenon’ which enables us to see a fast series of images as a connected whole (such as by circling a sparkler quickly, or rapidly alternating two light close to one another until the brain merges them, or even watching a film). It is also known that trauma cause some people to slip into believing supernatural phenomenon and finding patterns when there is none “.when we feel a lack of control we fall back on superstitious ways of thinking. That would explain why religions enjoy a revival during hard times…… [this also suggests] that god isn’t going away, and that atheism will always be a hard sell. Religious belief is the “path of least resistance”. Meanwhile, disbelief requires an effort. Comment from Eileen Weed: Not only does belief in god satisfy a deep, hard-wired tendency, but it also fulfills another craving to feel one is “chosen” and “superior” to the rest of the world. This in turn leads to another obsessive-compulsive draw for some to lead and others to blindly follow. Alas, religion will indeed always be around! This entry was posted on February 16, 2016 at 6:41 pm	and is filed under Sathya Sai Baba. You can follow any responses to this entry through the RSS 2.0 feed. You can leave a response, or trackback from your own site. Not only does belief in god satisfy a deep, hard-wired tendency, but it also fulfills another craving to feel one is “chosen” and “superior” to the rest of the world. This in turn leads to another obsessive-compulsive draw for some to lead and others to blindly follow. Alas, religion will indeed always be around!